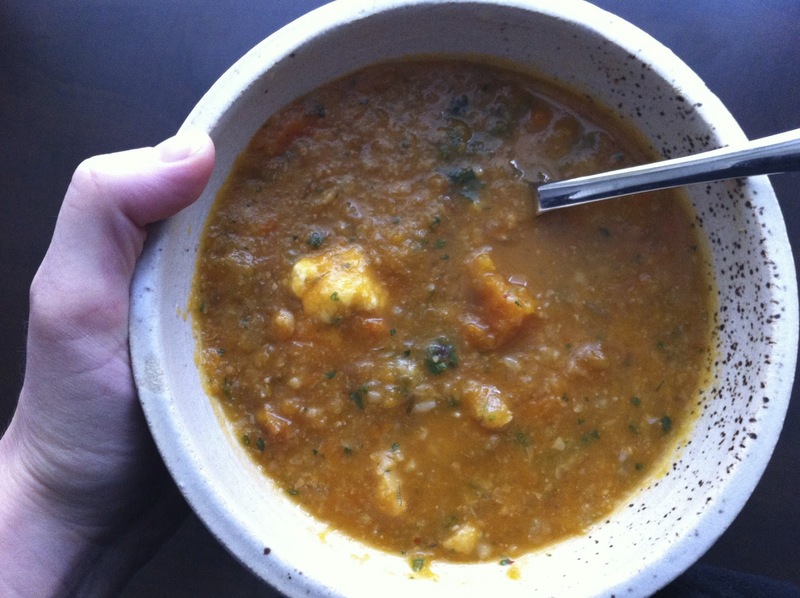 Healthy, quick, easy, delicious, butternut-squashy. Those are the words that best describe this soup. This is another Pinterest 'win' that was literally decided on in my car after leaving Costco and arriving at the grocery store. At Costco I had braved the cold refrigerated produce section of the store to grab some blackberries (totally out of season, I know, but they called to me), the new packaged kale salad that everyone is raving about (yet to try! ), and a two-pound container of pre-cubed butternut squash. At the grocery store I realized that I had no idea how I was going to use this much butternut squash, and with Souper Sunday looming, I used the Pinterest app on my iPhone to quickly search for a butternut squash soup recipe that had other vegetables in it too. I already have my own personal favourite pureed butternut squash soup recipe (recipe here), so I wanted to try something a little bit different. I found this recipe, originally pinned from Cookin Canuck website, and it's a winner. There is nothing bad for you in this soup. 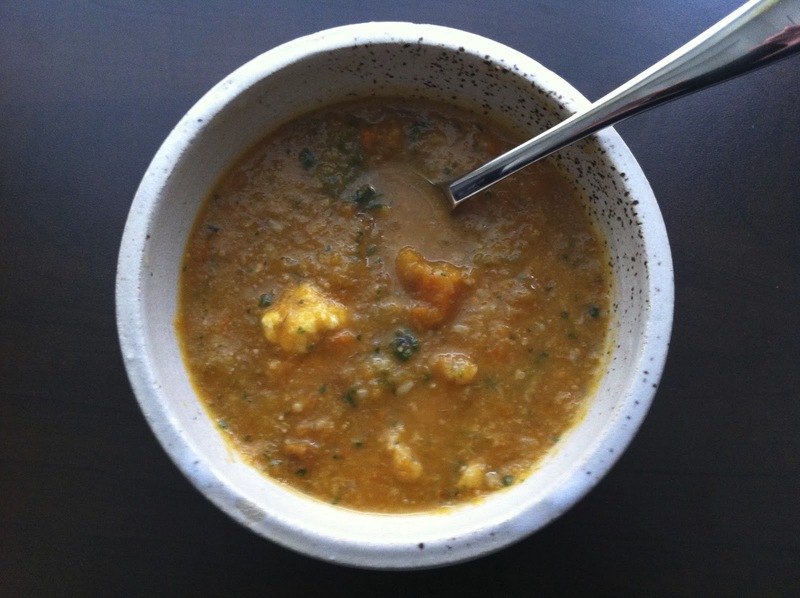 Cauliflower, celery, carrots, onion, herbs, a little spice, and some butternut squash to help make it all creamy. The 1/2 cup of black beans may seem a little random, and that's because it is. It was left over in my fridge from a quinoa salad I recently made, so I threw it in. I liked the addition of the beans, and would probably make it again this way next time. I mentioned that I bought a two-pound container of cubed butternut squash, and this recipe only uses 3/4 pound, so guess what's for dinner tomorrow tonight!? Butternut Squash Risotto - can't wait! I will post the recipe on the blog soon. Have a great week everyone...time for the Oscars! Heat olive oil in a large saucepan over medium heat. Add the onion and cook, stirring occasionally, for 5 minutes, or until the onion becomes soft but not translucent. 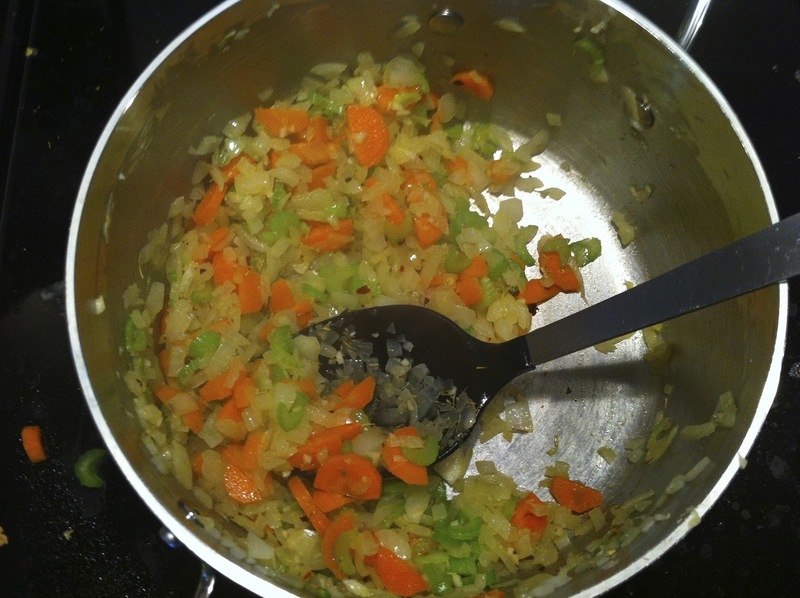 Add the garlic, carrots, celery, dried chili flakes, dried thyme, and salt, and cook until the vegetables are soft, about 5 minutes. Oops it appears that a piece of celery and a piece of carrot jumped ship. Stir in the tomato paste, and cook for 1 minute. Add the cubed butternut, cauliflower florets, chicken broth, water, and bay leaves. Bring mixture to a boil, then reduce to a simmer with a lid partially covering the saucepan, for 15 to 20 minutes, or until the squash and cauliflower are tender. Let the soup cool for 10 minutes, then transfer 2 cups of the mixture to a blender and puree until smooth before adding back into the soup. Alternatively, use a hand blender and partially puree the soup right in the saucepan, being careful not to puree too much of it. Stir in the parsley (and the black beans if you are using them), and add salt and pepper to taste. Serve hot. Enjoy!